Giclee prints for purchase. Originally painted in 1971. 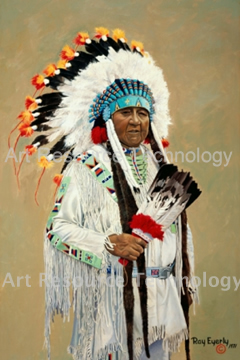 Chief Clarence Burke (July 4, 1891-July 2, 1987) was at one time the most photographed Indian in America and for years an icon at the Pendleton Roundup. The home of the Confederated Tribes of the Umatilla is the area now known as northeastern Oregon and southeastern Washington. Unframed print size is 36″ x 24″ with a 2″ margin for framing. Epson long-life (archival) inks are used on acid free fine art canvas and finished with a UV protectant. Price includes shipping.